Dragon slowly crawls out of the burning field, leaving behind the corpse of Damien DarkLord as it is consumed by the flames. He is horrified to discover that he is in the middle of a post-apocalyptic landscape with fire-pits billowing out huge pillars of flames into the sky. Dragon tentatively walks out into the destruction and believes that his killing of Damien may well have ruined the entire world. He had no idea that messing with time would result in this disaster. A noise is heard and Dragon realises that he is being spied upon and he calls out to the figure nearby who promptly runs away. This boy leads Dragon into an ambush by a gang of super-freaks whose membership includes a monstrous creature called RudeHead. The brute attacks Dragon but his attacks are narrowly avoided and he is soon defeated. Dragon hopes that having their largest member fall would cause the gang to retreat or stand down but they instead dog pile him. Dragon casts aside his assailants who now accept how dangerous he is, causing the group to cower in fear. As the hero approaches them to find out why he is being attacked, Dragon steps on a trapdoor that leaves him plummeting into a darkened chamber. He is attacked by a giant spider whose speed and strength are frighteningly enhanced. Dragon is pinned by the creature’s webbing but refuses to surrender to a potentially horrendous death and instead leaps back up through the hole, dragging the spider with him as it is still attaching to its webbing. The spider moves towards an easier meal and begins feasting upon the gang that had attacked Dragon. Dragon cannot stand by and allow his former assailants suffer such a terrible death and after he severs the web-line attached to him, he uses it like a rope. The arachnid has its own webbing wrapped around its neck before it is swung back down the hole. Dragon turns his attention back to the gang but they have fled the scene by now. With little else to do, Dragon continues to walk across the devastated cityscape and queries whether or not his past is similar to his counterpart from this reality. He even contemplates that his original awakening in a burning field with amnesia may have been the result in a previous meddling with time. As questions race through his head, Dragon is interrupted when lightning bolts strike down beside him. He is now being attacked by a man riding a dragon who continues to hurl lightning down at him until Dragon retaliates by launching a boulder at the dragon, knocking both rider and steed to the ground. The rider is killed upon impact but Dragon takes advantage of the situation by taking his dragon to serve as his own mode of transport. Dragon is soon airborne and is shocked to discover that this city in ruins is actually Chicago and that his hometown is now a burnt out wreck. He notices the precinct where he once served with the Chicago Police Department and hopes that his friends all survived its destruction. Dragon is unaware that his flight is being monitored from a dilapidated building where two figures launch an assault. Their rocket launcher blows up the head of the dragon, leaving its rider hurtling towards the ground. 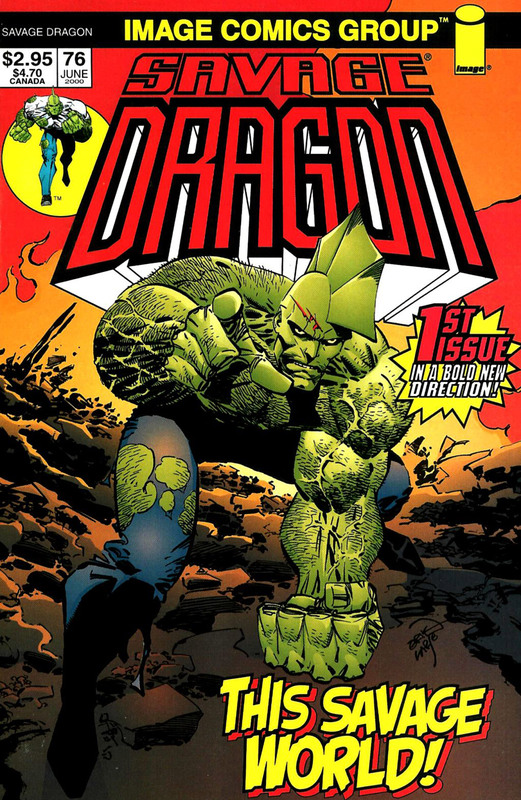 Before making impact, Dragon grabs a hold of a building’s wall and climbs back up before punching his way inside. He races towards where he believes his assailants are hidden and is accused of being one of the Sky-Riders. This rival group has been stealing food and even women from the Rats and Dragon was assumed to be one of them. Goofus and Gallant proceed with a physical assault upon Dragon but they are eventually overpowered and rendered unconscious when their heads are struck against one another. Dragon is confused by all of the events that have occurred since his arrival in this new reality. He cannot work out why he keeps getting attacked or where the ordinary citizens of Chicago have gone. Dragon decides to head out towards the suburbs in the hope that it is in better shape than the city. The hero begins the long walk out towards the house of Jennifer Murphy, hoping that she has survived through the catastrophes that have afflicted Chicago.